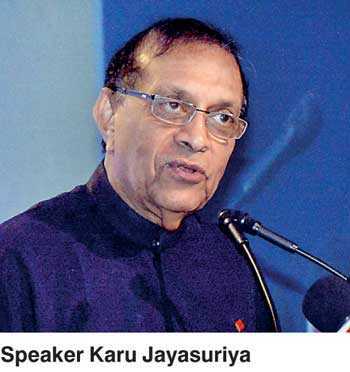 Speaker Karu Jayasuriya believes that given adequate opportunity and proper training, women operating at the grassroots level can be successful entrepreneurs and exporters who can contribute substantially to creating inclusive economic development in Sri Lanka. Speaking as the Chief Guest at the eighth edition of the ‘Top 50 Professional and Career Women Awards 2018’ organised by Women in Management (WIM) and IFC, a member of the World Bank Group, he pointed out that Sri Lanka was blessed with intelligent, hardworking and successful women in all sectors of the economy. “I was highly impressed with the theme of this event ‘Taking Sri Lankan Women to the World’ because it is something our ladies deserve. With this type of courage, talent, intelligence and capability, I am confident that our women can take this country forward,” he added. Jayasuriya called on female leaders to seriously consider the export sector, which could allow them to take their industries to international markets, thereby enabling them to assist the development of the national economy with much-needed foreign exchange earnings. “Please look at the export sector. Over three decades ago Sri Lanka was a significant player in international trade and due to various reasons we have now fallen back in our exports. Our economy today is highly dependent on imports and unless we correct this mismatch in our trade, it is going to be difficult to overcome economic challenges. Thus Sri Lanka will have to either export or perish,” he said. Offering an observation on the female leaders present at the award ceremony, the Speaker revealed that he noted over 25 female billionaires, while expressing that his sincere wish was to eventually produce dollar billionairesin Sri Lanka. In terms of female representation in the political arena, Jayasuriya noted that thanks to the efforts of the National Government they were able to bring about legislation to have more females at the local government level, while adding that there was a long way to go in making an effective transformation to Sri Lanka’s political culture. “Although we had the world’s first woman Prime Minister in Sri Lanka, it is unfortunate that out the total 225 members of the Parliament there are only 13 female representatives. I have also tried to get more women into politics but I have failed.I have also chaired some nomination boards and sometimes the female candidates withdraw their names weeks before the elections.I don’t blame them because the political culture here is such that the ladies are subjected to various harassment and insults, thus they are very cautiousabout entering politics,” he stressed. He also said that despite 53% of the country’s population being female, when it came to an election they tended to vote for a male candidate over a female candidate. Outlining some of the setbacks in the economy, he listed infrastructure, holidays, productivity and public service as key areas that the Government needed to address in the immediate future. Noting that before entering politics he was engaged in the private sector for 32 years, Jayasuriya asserted that the productivity levels in Sri Lanka were still very low compared to other countries in the region, which needed drastic improvement. He said holidays were amajor drawback, which had resulted in the country’s economy making slow progress. “Sri Lanka’s got the highest number of holidays in the world. I have calculated and an average public servant works only for 176 days a year, excluding the individual annual leave, sick leave, public holidays and others. Luckily next year I think most holidays are falling on weekends, therefore probably we will have a more productive year in 2019,” he quipped. Jayasuriya also emphasised that the large public service in the country had become a great burden to the economy with high expenditure and low productivity. “The world over, on average,among every 250 people you have one public servant. However, in Sri Lanka for every 15 people, we have one public servant. This is something that requires the attention of the Government,” he stressed. The Speaker insisted that if Sri Lanka was having the largest public service, then it better be the best public service as well.